MACROCYSTIS PYRIFERA, also known as the giant kelp, is one of the fastest growing plants on the planet. It grows up to 3 feet per day at some points in its life cycle. It is also one of the highest oxygen producers in the ocean. Kelp can act as a biofilter and as a bioindicator for water quality. It is a major component of a healthy temperate marine ecosystem, producing a benefit to the water similar to the rain forest's benefit to the atmosphere. In fact, many consider kelp forests to be underwater rain forests. Kelp is also known to keep the water glassy and clean. It may have potential as an alternative energy biofuel. Kelp has many commercial uses because of its algin content. 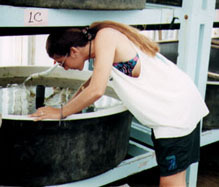 Recently, there has been interest in its use as a food source for abalone aqua culture. Due to increased stress on natural forests along the Northern Baja California coast, an ecosystem restoration project restoring kelp beds in this area has begun, under the auspices of the Universidad Autonoma de Baja California (UABC) in Ensenada, Mexico, and under the guidance of Dr. Jose Zertuche, Professor, Instituto de Investigaciones Oceanologicas of UABC. All materials copyright 1998 by H.B.L.